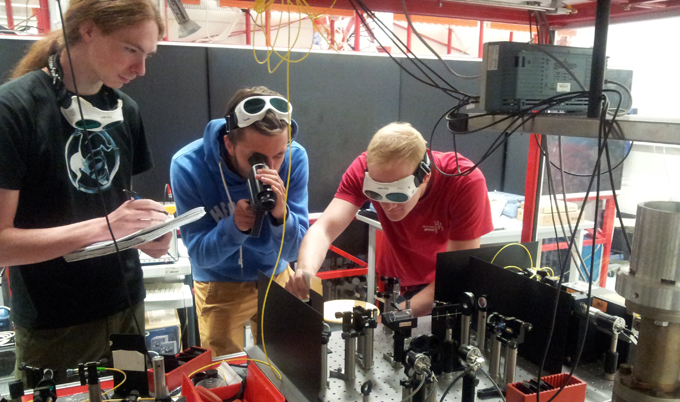 The advanced lab course offers the opportunity to undertake complex physics experiments in our research institutes already during your Bachelor’s and Master’s studies. Students at a FOPRA experiment (No. 5: Doppler-Free Saturated Absorption Spectroscopy). Photo: C. Hamsen. To participate in the advanced lab course you need to register and team up with two other students of similar interest. Registration is open starting Mon, 2019-04-08 until Sun, 2019-05-05, 23:59. The teams then register for the individual experiments from Thu, 2019-05-09. The registration for experiments is done by one of the team members representatively for the whole team via the link below. For the present each group can register for four experiments. The registration can be done via the advanced lab course page for students. There you also find current information for each step. A safety instruction is obligatory for each participant before taking part at the advanced lab course and then at least once a year. The safety instruction including a test is done in an online Moodle course. At the start of each semester there will be an info event for the advanced lab course. In this meeting individual questions will be answered and problems concerning team formation will be solved. To take part at the electronics lab course (digital course part) (weekly fixed date, Monday or Wednesday afternoon, schedule) a separate registration via TUMonline is necessary ("First come, first serve"). The lab course at the accelerator lab takes place for all groups from 3rd to 4th of June 2019. 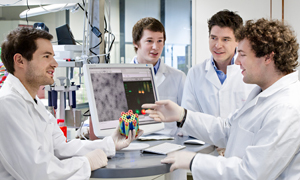 The experiment takes place at Halbleiterlabor der Max-Planck-Gesellschaft, Otto-Hahn-Ring 6, Siemensgelände Geb. 72/R233. Bitte kontaktieren Sie den Betreuer auf Englisch. The electronics lab course consists of an analog electronics part (winter semester) and an digital electronics part (summer semester), each extending over a whole semester with a weekly fixed date. Both the analog and the digital electronics part gives 2 credits so that each of the part can replace two (normal) advanced lab course experiments. However during the bachelor lab course only the analog electronics part can replace other experiments, during the master lab course either the analog electronics part or the digital electronics part can replace experiments. 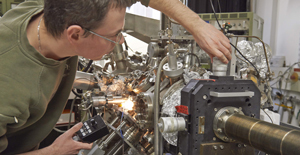 The experiments of FOPRA are integrated according to the topic in the experimental groups of the Physics Department and the participating Max Planck Institutes, where they are carried out. It is the ideal opportunity to learn a bit more about the research done in each place and to gain important information regarding the future specialization or the choice of the Bachelor's/Master's thesis. Each experiment is assigned to one or more major fields of study (KTA, KM, BIO, AEP; see experiments). The overall supervisors of the FoPra are Prof. Stutzmann und Prof. Schönert. There is no grading the performed experiments, the corresponding supervisors will only decide whether the student has passed. For each successfully completed experiment one credit is recorded, with the exception of experiment no. 52 and 61 and the electronics lab course, for which two credits are booked. Please pay attention to the specific rules of the electronics lab course. Each successfully completed experiment will be entered by the corresponding supervisors in TUMonline as passed exam. Every participant is asked to check that her/his entry in TUMonline is done promptly after finishing the experiment. Within the Bachelor's program course 6 CP have to be achieved from the FOPRA. To orientate oneself in all scientific directions, there are no restrictions concerning the attribution of the experiments to certain major fields of study. Since the FOPRA takes place during the winter and the summer semester we recommend to perform 4 experiments during the winter and 2 experiments during the summer semester. Within one of the Master' programs 6 CP have to be achieved from the FOPRA. In doing so at least four CP must originate from the elected major field of study (Applied and Engineering Physics / Condensed Matter Physics / Nuclear, Particle and Astrophysics / Biophysics). We recommend to perform three experiments in the winter semester and three experiments in the summer semester. The experiments no. 52, no. 61, as well as the electronics labs count as two experiments (2 CP) each. Within the Master's program in science education (mathematics / physics) 4 CP in FOPRA have to be achieved. There are no restrictions concerning the attribution of the experiments to certain major fields of study. Your contact data will be imported automatically from TUMonline. So please pay attention that your phone number ist registered in TUMonline and that you get the messages to the email address which is deposited in your TUMonline account. Changes of supervisors at your experiment should be reported to Andreas Hauptner. An overview of the data to your experiment and of the registered students you can find at Page for supervisors of FOPRA.